The Galaxy Tab A 8.0 has an 8.0-inch, 1024×768 display, Snapdragon 410 processor, 2GB RAM, 16GB memory, 5 megapixel rear camera, 2 megapixel front camera, LTE, and Android 5.0 Lollipop. The Galaxy Tab A 8.0 looks like an overgrown Samsung smartphone that is stretched in every direction, especially horizontally. The tablet has a 4:3 aspect ratio that is common for iPads but somewhat unusual on Android tablets. The design is similar to the iPad mini, with thin bezels on the side and taller bezels on the top and bottom. The side bezels don’t seem like much but are enough to hold the device comfortably. Unfortunately though, unlike iOS, Android does not have thumb rejection for when it does end up wandering on to the display. On the front is the 8.0-inch display, with the back and multitasking buttons below and a physical Home button between them. Above the display is an earpiece because Samsung actually wants you to make calls on this. Can’t blame them for that because some people do actually use tablets as phones (they also use shovels as spoons). On the right is the power button and the volume control button. The alignment should have been reversed with the power button below as it’s used more often. On the bottom is the microUSB port, headphone jack and a single loudspeaker. The speaker positioning makes it very easy to cover it with your hand when you hold the tablet, so you have to hold it the other way around. The back of the tablet has a matte finish that still somehow manages to attract smudges. There’s also the raised 5 megapixel camera lens that sticks out quite a lot but is probably designed to to make the tablet easier to lift off a surface. There are also slots for attaching the optional cover to the tablet. As with most Samsung products, the Galaxy Tab A 8.0 feels excessively plasticky but at the same time is reasonably well built. It really doesn’t feel premium at all but it’s quite light and easy to hold and carry around. 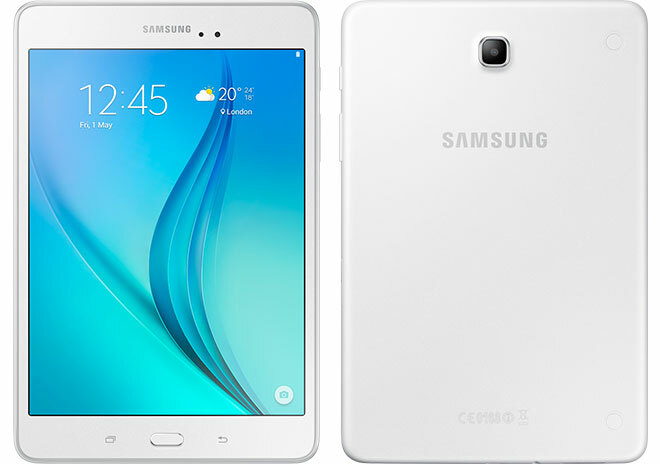 The Galaxy Tab A 8.0 has an 8.0-inch, 1024×768 resolution IPS LCD. The display is really the Achilles heel of the tablet. The pixel density is far too low in this day and age. Even budget smartphones have sharper displays now so seeing this resolution on an 8.0-inch display is really disappointing. The actual quality of the display is not bad otherwise if you look past the pixel density but for a device meant primarily for reading the resolution is quite a letdown. The Galaxy Tab A 8.0 runs on Qualcomm Snapdragon 410 with 2GB of RAM and 16GB internal storage, of which 11GB is available to the user. There is also a microSD card slot. The tablet also supports 4G LTE bands, with Wi-Fi 802.11n, Bluetooth 4.0, and GPS. On the software side, the tablet runs on Android 5.0.2 Lollipop with Samsung’s TouchWiz interface on top. Even though the device has a 64-bit chipset it doesn’t actually run in 64-bit mode. The software is similar to what we saw on the Galaxy S6 for the most parts but optimized with tablet interface in mind. You also get the split view mode, which works far better on a tablet than on phones. Unfortunately, most of the Android apps don’t take proper advantage of the tablet interface and show blown up phone UI, which wastes a lot of the screen space. Considering the modest specifications, the Galaxy Tab A 8.0 wasn’t going to blow anyone away with its performance. However, in day to day usage, the tablet works surprisingly well most of the time. It’s not the silky smooth experience that you might expect from a Lollipop device but considering the specs it’s reasonably smooth and doesn’t really feel sluggish. Gaming is also quite decent, with most games running surprisingly well, although it must be said most games don’t look that great as they are designed for a widescreen display and don’t quite expect a 4:3 display on an Android device. The multimedia performance is not too impressive. Videos in particular don’t look too hot on that 4:3 display, and the low resolution doesn’t help. The loudspeaker also sounds tinny and isn’t really loud. Just like Apple, Samsung doesn’t provide any earphones in the box either so you have to find your own. Considering it’s a tablet, the camera is not really going to be a priority for either Samsung or the customers. As such, you shouldn’t be surprised to see a basic 5 megapixel autofocus camera. For what it’s worth, the camera is not bad at all. At least not the one on the back although the front camera is a bit depressing, especially since it will get used a lot often for video calls and such. Being a budget offering, it’s hard to nitpick a lot about the Galaxy Tab A 8.0. On Amazon, for example, it’s priced at just $180, which is not bad at all. In other markets such as India, for example, it is a bit expensive (INR 20,500 or $323), and then you’d rather just get something like the Xiaomi Mi Pad, which is not only cheaper but a hell of a lot better in every way. If you want a cheap tablet for basic usage and getting this one cheap enough in your region then it’s worth a look otherwise you might want to look elsewhere.